The benchmark S&P 500 index rose by 0.91 percent in April. That was below the 2.69 percent average gain seen during the four months immediately following the election but still a welcome turnaround after March’s 0.04 percent decline. Participants in tax-advantaged 401(k) plans fared even better in April, according to new data from the Employee Benefit Research Institute (EBRI). Specifically, the average 401(k) account balance for younger (25-34), less tenured (1-4 years) workers rose by 2.5 percent last month, while older workers (55-64) with more than 20 years of tenure saw their 401(k) balances rise by an average of 1.2 percent. Even more impressive is that since the start of 2015, the average 401(k) account balance for younger, less-tenured workers has surged by 115.9 percent, while the S&P 500 has gained just 15.8 percent. Older, more-tenured workers saw their 401(k) balances rise by an average of “only” 22.0 percent during this same period, not surprising since these individuals tend to have much larger accounts that are less sensitive to both contribution size and market fluctuations. More importantly, these substantial gains should provide more evidence of how effective consistent participation in a tax-advantaged savings vehicle can be when trying to amass a significant retirement nest egg. Additional help is possible when a 401(k) participant fully utilizes their employer-provided matching contributions. Indeed, lots of employers sponsoring 401(k) plans will match their workers’ retirement contributions up to a predefined ceiling. In fact, more than two-thirds (77 percent) of 401(k) plans in America included some sort of contribution match in 2014, according to the most recent Investment Company Institute (ICI) and U.S. Labor Department data. 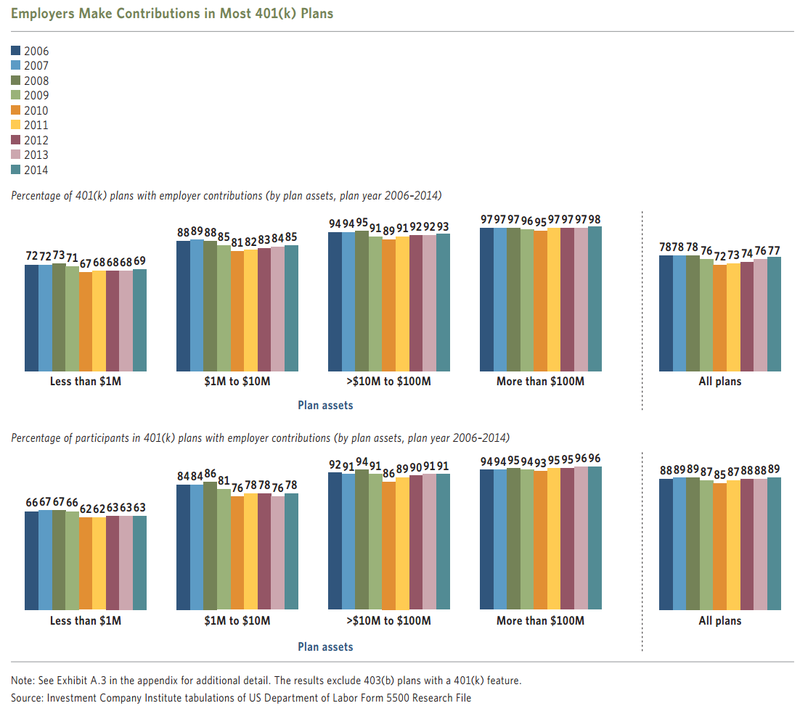 Nearly nine out of ten participants were in plans with employer contributions in 2014, a reflection of the fact that larger 401(k) plans are more likely to offer matching contributions. Despite the wide availability of the contribution match, many 401(k) participants keep their savings rate below a level that would take full advantage of what their employer offers. For some workers this occurs because they prefer smaller paycheck withholdings while for others it is because they never raise the savings level above the initial contribution rate. Regardless of why some 401(k) participants fail to fully utilize their available matching contributions, these workers need to recognize that they are possibly leaving a lot of free money on the table. Just look at an earlier Financial Engines study, which estimated that a quarter of U.S. workers eligible for a match do not save enough to receive their full employer contribution, and that the average amount of match that goes unclaimed each year is $1,336 per worker. At first glance that may seem like a relatively small sum of money. However, when considered over your entire working career, the amount of forgone retirement savings is significant because passing on the full employer match means that you are also passing on the tax advantages and growth potential that would come from using your 401(k) to invest those funds in the market.